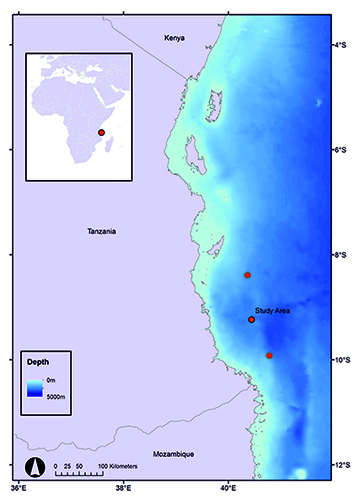 Deep-sea biodiversity and the effects of drilling disturbance in the western Indian Ocean off Tanzania. 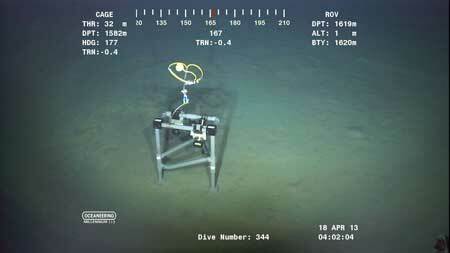 Using the Millennium ROVs on board the Deep Sea Metro 1 drillship, video and stills images have been collected and analysed to report the species encountered and to map the extent of dristurbance from drilling on the seabed. Sediment samples are collected to further investigate the drilling disturbance and the data are collated to improve our understanding of anthropgenic impacts in deep water. 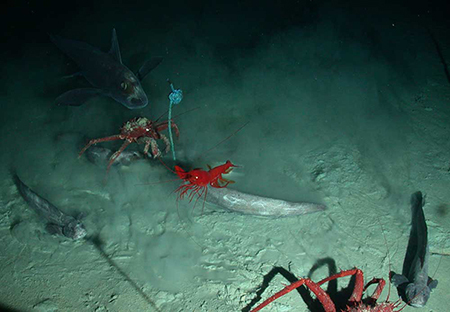 Feeding Frenzy: Photograph from time-lapse sequence when the baited camera was deployed in 1620 m water depth at Mzia-2. Species shown are a ghost shark (Hydrolagus sp. ), four eelpout (Pachycara sp. ), a large decapod crustacean (likely Plesiopenaeus sp.) and two stone crabs (Neolithodes sp.). a) Syringammina sp. a xenophyophore, b) Saccocalyx pedunculatus a distinctive hexactinellid (glass) sponge, c) Another hexactinellid sponge (Hyalonema sp. ), d), Antipatharia, Schizopathes sp. e) Isididae or Keratoisidinae, f) Rock covered with with epifauna including sponges, soft corals and brisingid sea stars, g) A sea star from the Pterasteridae family, h) Echinothuriid (a type of soft bodied sea urchin), i) Unidentified sea cucumber (holothurian) , j) Ghost shark - Hydrolagus afinis, k), Ipnops sp. l) Halosaur similar to Aldrovandia sp. 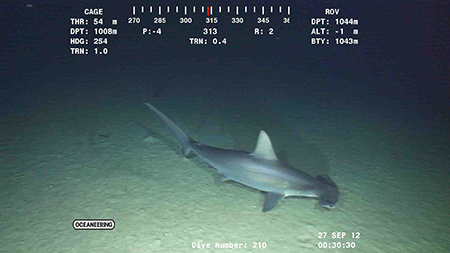 In situ observations in deep water provide opportunities to improve our understanding of the behaviour of deep-sea organisms that are rarely encountered. 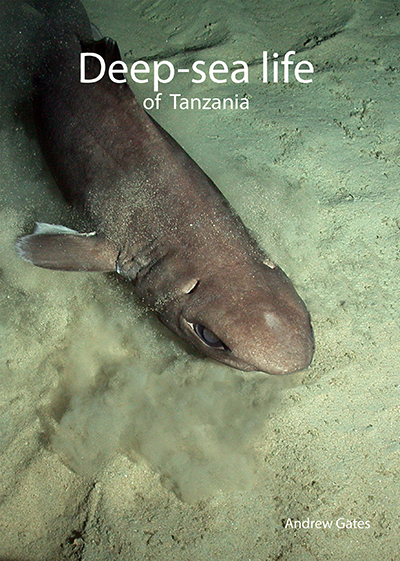 After observing a fish hiding under a black coral on several occations over the course of a week during a SERPENT visit to a drilling rig in the western Indian Ocean off Tanzania we decided to put a time-laspe camera on the location to observe the interaction. The fish, a cusk eel (Bassozetus) remained under the coral (an antipatharian, Schizopathes) for most of the duration of the timelapse footage (around 30 hours). The only occasions the fish left its cover it had returned in the subsequent frame. The observations have been published in the journal Marine Biodiversity and suggest the fish may expend less energy when under the coral. Other similar observations in the area suggest such associations are beneficial. 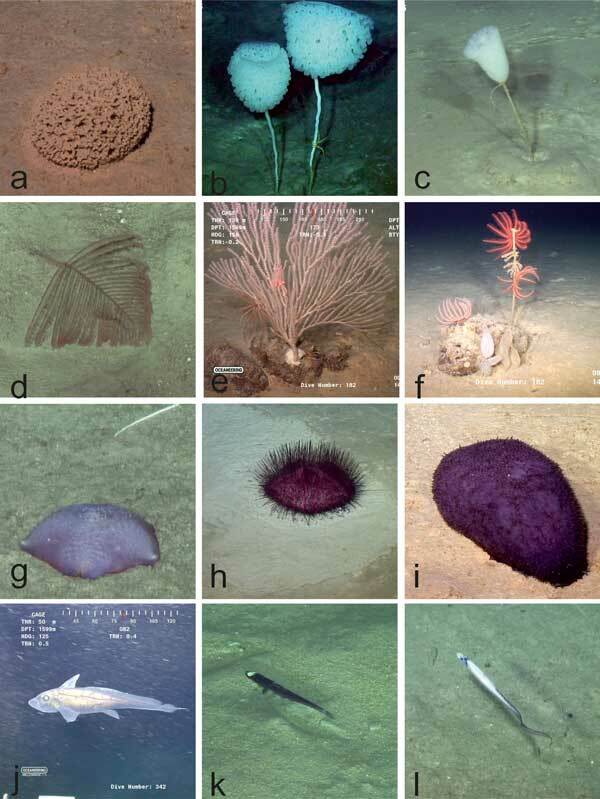 These observations were chance encoutners that show the importance of fine scale habitat heterogeneity in deep-sea environments and highlight how much there is to learn about the animals that live in the deep sea. 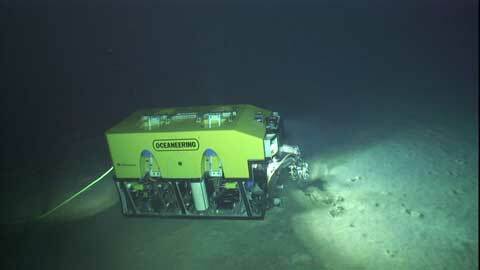 ROV observations are an important part of this process. The individual frames are 1 minute apart. 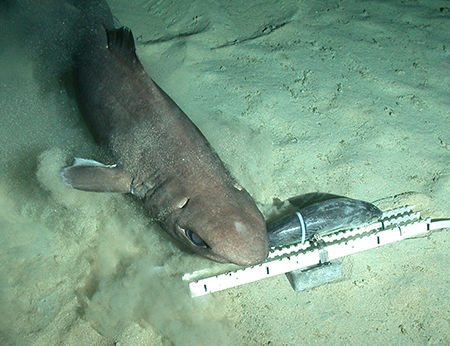 Observations of deep-sea animals are recorded in the SERPENT archive. A PDF of an article about the SERPENT work in BG Group's Links magazine.